This was the first time I made lemonade with the simple syrup and I really think it was worth the extra step as it eliminates having to stir forever to make sure the sugar is dissolved. Degree of sweetness is a matter of individual taste and preference, but 1-1/4 cups of sugar was just right for my tastebuds. 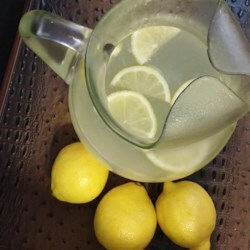 Will make lemonade with this simple syrup recipe from now on!